The STEEM price is down 9.15% verse the USD over the past 24 hours on higher volume ($8,830,350) as Bitcoin is down at $7.25k and the broader market is down. 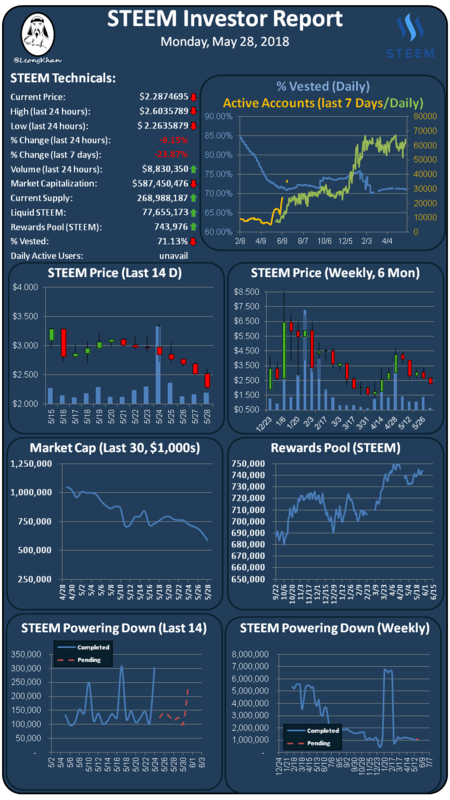 STEEM is down sharply verse Bitcoin as Korean trading is down at 17% of the trading volume. New account creation data is not available today. The % vested indicator is down slightly at 71.13% on steady power downs and low power ups. Daily active account data is not available today. SBD is at $1.64 on Bittrex which is still very elevated over the peg, receive you rewards in 50% SBD and then use the SBDs to buy STEEM on the exchange. SBD conversions are a waste of money again! It's going to be interesting to see where things go next. Steem is staying around 30th in the chart, but it's so volatile just now. The whole market is taking a beating. I'm actually hoping for STEEM to go a little further down verse Bitcoin so I can buy some more before the SMT release. Yes, I've been super busy at work. Things should be calming down in September or October and I'm hoping to get back on Steemit at that time. It's good to hear HF 20 is finally coming down next month. I probably won't make it to SteemFest because travel to Europe is pretty pricey from the US.